PLO Secretary-General denies Israeli report that he proposed to start secret negotiations with Israel last summer. 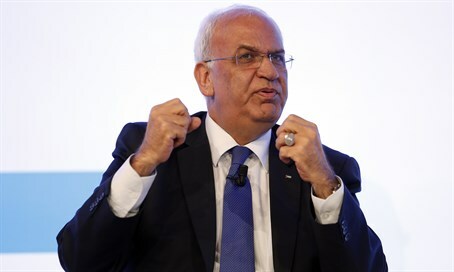 Palestine Liberation Organization (PLO) Secretary-General Saeb Erekat is denying reports in Israel that he proposed to start secret negotiations with Israel last summer, the Ma’an news agency reported on Monday. Erekat’s denial was in response to a report on Kol Yisrael radio, which said Erekat had proposed secret negotiations, but Israel turned down the offer. According to the Kol Yisrael report, Erekat made the proposal during a meeting on July 24 in Jordanian intelligence offices in Amman with outgoing minister Silvan Shalom, who was in charge of negotiations with the Palestinian Authority (PA). The station said that Erekat and Shalom met again three months later in Cairo, where Shalom notified Erekat that the Israeli government rejected his proposal about secret negotiations. While Erekat confirmed in a statement quoted by Ma’an that he met with Shalom in Amman and Cairo in July and August, he denied proposing secret negotiations with Israel. The two reportedly discussed Palestinian demands regarding a return to negotiations, which were then rejected by Shalom during the meeting, Erekat said. Erekat added that he demanded a return to the pre-1967 borders, the release of terrorist prisoners by Israel, as well as an end to “settlement expansion”. Prime Minister Binyamin Netanyahu’s office also denied the report, saying that Israel has always been willing to start negotiations but it is the Palestinian side who refused. Israel-PA peace talks have been frozen since 2014, when the PA unilaterally joined international organizations in breach of the conditions of the talks. Since then, the PA has been on “diplomatic offensive” against Israel, joining international organizations such as the International Criminal Court (ICC) and submitting “evidence” of alleged Israeli war crimes against Palestinians with the intent of having the court prosecute Israel. PA leaders have also been directly involved in incitement to terrorism against Israelis, which has been one of the main caused for the current terror wave. Erekat recently paid a condolence visit to the family of a terrorist who shot and wounded two Israelis before being killed by the IDF. Last week he compared Jewish residents of Judea and Samaria to jihadists from the Islamic State (ISIS) group. PA chairman Mahmoud Abbas has incited as well, having recently called on Palestinian Arabs to “liberate” the Al-Aqsa Mosque in Jerusalem from Jews and their “filthy feet”.